Xavi Lang has been a nurse for more than a decade but becoming a fantasy author is her ultimate dream job. With no formal training in creative writing, Xavi attended writing workshops and writers’ events across the Greater Toronto Area and worked on her first novel, The Oranyn. She currently lives in Toronto, Ontario with her husband and their adorable son. 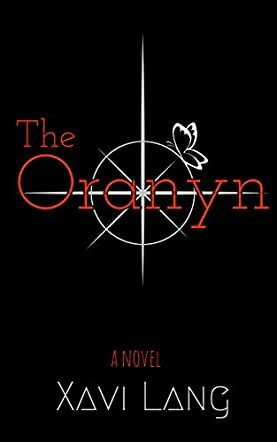 The Oranyn by Xavi Lang is the captivating adventure of Elia Egerton's journey as she fulfills her destiny. Elia was taken from her world and raised by a loving family to keep her safe. Now it's time for her to return and follow her calling. As the last Oranyn, only she can awaken the seven Elysares and save Astrofyr. Elia is reluctant to leave her family and face the past she thought was behind her, but she has no other choice. She must face her memories and uncover secrets from her past while turning to her allies for help facing dangers and traveling home. Before Elia returns to her world, an absence is deeply felt so when she receives the living memory of her sister, a void is filled but a distance is still present between them. The memories also hold pieces of her past which are woven through various memories, revealing the presence of a blue-eyed boy. This sparks a greater mystery about who he is and his identity plays into her role as the Oranyn. Elia has a great deal of pressure on her shoulders and to work through as she's the only one who can save this world from being destroyed. Before she can be the Oranyn, she has to confront her memories and face the past she's buried, taking her on a journey to accept who she is and who she's meant to be. She has to deal with the tragedy and darkness from her past in both worlds in order to find a way to move forward. Memories play a key role in how the story progresses as the literal living memory of Elia's sister stays at her side throughout everything while acting as her confidant and her support. This relationship is one of the most important as her sister's loss constantly weighs on her. The grief is felt from the beginning and Lang brilliantly weaves the sisterly dynamic and previous issues they buried into their relationship. Lang also weaves in elements of romance which are heartfelt and add a spark of light throughout the story. The Oranyn is an adventure filled with danger, self-discovery, and romance, exploring the bonds of family and friendship, and the journey to overcome past darkness and find the light. The Oranyn is a lengthy work of epic fantasy fiction, written for young adults by author Xavi Lang. We follow our young heroine Elia Egerton, first in her life on Earth. Elia has spent her youth hidden away as the last Oranyn, prophesied to stop the destruction of another world very far from Earth indeed. When Elia is discovered in her new life, she resists the call to return and become the savior of her destiny. But the beasts keep coming to take her back, and she can’t run from the future forever. Especially not when her life on Earth and the people she loves there are threatened too. This is a long novel for more mature YA readers, and it moves along at a good pace with plenty of details and world-building as the plot thickens in later chapters. Elia begins the tale in emotional distress, grieving but generally grateful for her life on Earth and the people around her. The action develops quickly and the foes she faces are well described, adding tension to the cinematic feel of author Xavi Lang’s prose. The plot is winding and complex, with many satisfying twists and new discoveries to make along the way. Aurelia/Elia’s tragic past is revealed alongside her incredible powers and the political struggle of those around her, which causes her to go into hiding in the first place. Overall, The Oranyn presents a fascinating new world for readers to get their teeth into, with a relatable heroine who turns out to be superbly powerful and engaging to follow. The Oranyn by Xavi Lang is a well-written young adult epic fantasy with a setting that involves other worlds and a strong female protagonist. Elia Egerton is the last of the Oranyn, smuggled to Earth from another world where her life has been threatened. She has more power than anyone could imagine, as the one destined to bring the cores together and awaken the Seven Elysares. She is also the only one gifted with the power to stop Astrofyr’s sun from collapsing. But with a new family on Earth and a new life, all that doesn’t matter to her anymore. Not until she is attacked by a creature from Avisadis and left for dead. She now knows that her world is in grave danger and only she can save it. Follow her on a perilous mission to save her own world, a journey filled with danger and ferocious enemies. Elia is introduced to the reader from the very beginning of the narrative, a forlorn girl just returning from the cemetery, but there is something intriguing about her. She is there, but she seems to be absent psychologically. The author gives readers glimpses of her character and who she is and leaves them with intriguing descriptions such as: “She looked down on her palm. Eight tiny points in the shape of a heptagon and one in the middle protruded from her skin like insect-bites. She curled her hand into a fist…” The Oranyn is a beautifully written story that will appeal to fans of I Am Number Four and readers who enjoy science fiction and action-packed stories. The characters are real and well developed and it is easy for readers to relate to the protagonist. The prose is powerful, mixed with great dialogues and vivid descriptions. The conflict grows in intensity and the reader becomes engrossed in what happens next to the protagonist.